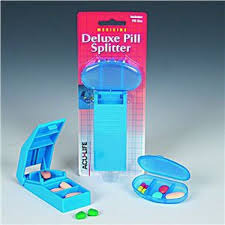 Acu-Life Deluxe Pill Splitter with Pill Box 2 Each, you can now split any size pill or tablet. What you have to do is twist it once, and your tablets are crushed to your specification. No muss, no fuss! You can also store pills in this container for travel or home. Also, use this as a drinking cup. For cutting large pills before crushing. Suitable for those who are unable to swallow pills. With pill carrying compartments. 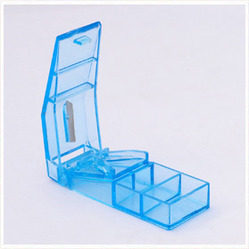 As per the needs and requirements of our clients, we are involved in providing Plastic Pill Cutter. - Cuts Tablet in half. - Cuts all shapes and sizes. - Flexible arms help accurate cutting. It is useful in those cases where it is required to cut pills or tablets in smaller pieces. Tablet Cutter offered by us is available in different sizes as per the need and requirement of customers. It provides an effective way to store, cut and crush tablets. Tablet Cutter is a tablet cutter, that provides an easy, safe and convenient way to cut or split tablets in half. It is made of ABS plastic and has a compact, neat and novel design. It offers the convenience of managing tablets in exact parts. - Easy to use / maintain. - Color / Design based on Stock availability.